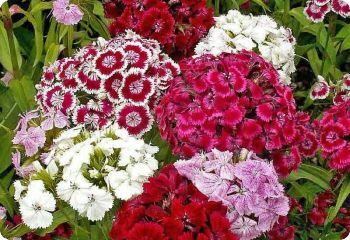 Sweet William is a popular cottage garden plant with solid or bicolor flowers in various shades of pink, red and white. The sweetly fragrant flowers attract hummingbirds and butterflies. Dianthus barbatus Mix is a good choice for a cutting garden. It will provide you with a bounty of colorful, fragrant flowers over a long season. Dianthus barbatus is easy to grow and very rewarding. It performs as a biennial or short-lived perennial. Deer resistant. Hardy in zones 3-9. Start Sweet William seeds indoors 8 weeks before the last frost date. Or sow outdoors after the last frost. Barely cover the seeds with soil. Full sun. Well-drained soil.